During partner exercises it is not always necessary to touch each other. We can also observe and react to each other’s intention from a distance. This ‘observing outside the body’ increases our sensitivity. It also develops our capacity to send internal force out of our body and influence someone else. 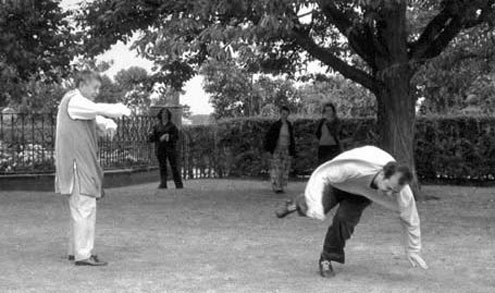 Examples of this kind of exercises are ‘TuiShou without touching’ as well as BaGua, whereby two people walk in a circle around one another and try to observe each other’s intentions.